On April 21, 2011 there are several websites down. Among the affected are HootSuite, Reddit, Foursquare and Quora. The problems appear to be caused by an issue affecting the Amazon Web Services. The company claims that are working to resolve the problem. Amazon Elastic Compute Cloud, Amazon Relational Database Service and Amazon Elastic Beanstalk also appear to be experiencing problems. The issues were all visible on 4/21/2011 at Amazon’s AWS Service Health Dashboard. While critics may be quick to point the drawbacks of cloud computing, it is important to keep a cool head and keep a full picture of cloud computing: benefits and drawbacks. Organizations that really heavily on cloud computing need to have an appropriate plan of action to tackle downtime problems. 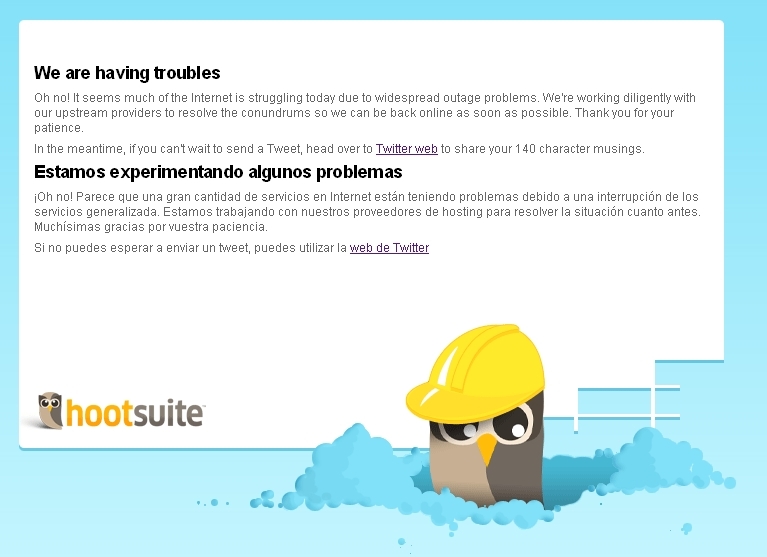 From the image above, you can see that HootSuite is “struggling today due to widespread outage problems” and ” working diligently with our upstream providers to resolve the conundrums so we can be back online as soon as possible”. 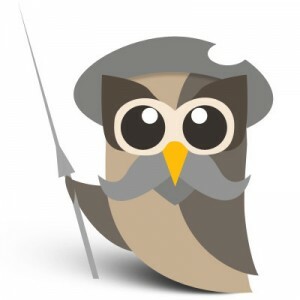 Then, Hootsuite goes on to present the same message in Spanish. ¡Oh no! Parece que una gran cantidad de servicios en Internet están teniendo problemas debido a una interrupción de los servicios generalizada. Estamos trabajando con nuestros proveedores de hosting para resolver la situación cuanto antes. Muchísimas gracias por vuestra paciencia. Extra points on use of accent marks, use of vuestra, and signos de exclamación. Why HootSuite is Doing This? Hispanics made up 12.3% of the total US Internet population in 2009, and that number will increase to 13.9% in 2013. The U.S. Hispanic presence in the Internet is not only going to increase in quantity but also in quality as Hispanic U.S. Internet users are poised to have the highest purchasing power. Savvy Internet startups should keep these 2 facts in mind. Gracias por la referencia al detalle del idioma español. En HootSuite estamos apostando muy fuerte por el idioma y tenemos nuevas y grandes noticias al respecto que publicaremos en breve. El número de usuarios hispanohablantes de HootSuite ha aumentado prácticamente un 100% en los últimos meses y estamos realmente contentos por ello. Recibe un muy cordial saludo, a tu disposición. Muchas gracias por tu respuesta. ¡Qué interesante estadística! La comunidad hispanoparlante es muy activa en Twitter y este dato lo confirma. Permanece atento al blog de hootsuite (blog.hootsuite.com), publicaremos otros muchos datos interesantes sobre nuestra comunidad hispanohablante la próxima semana.